Is Brown Rice Or White Rice Healthier? According to researchers, brown rice is better for a variety of reasons that contain a range of nutrients like proteins, thiamine, calcium, magnesium, fiber, and potassium. 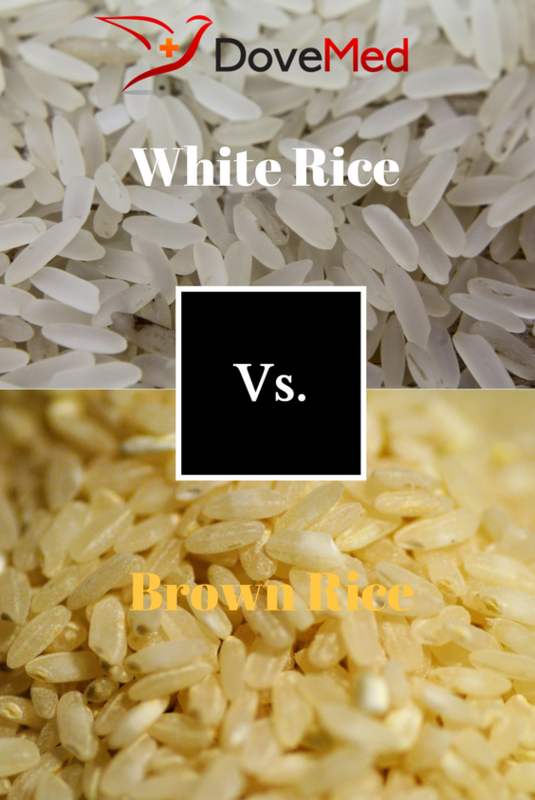 Brown rice and white rice are from the same plant, but there is only one difference. Brown rice is the “unrefined” version of white rice. Unlike white rice, brown rice has the hull and bran that speeds up cooking time and makes it easier to digest. Brown rice is better for a variety of reasons. The hull and bran provides the wholeness to the grain, containing a range of nutrients like proteins, thiamine, calcium, magnesium, fiber, and potassium. Also, brown rice is lower on the glycemic index than white rice. The glycemic index (GI) rates food and drinks based on their blood sugar surge potential. Foods high on the glycemic index, like white rice, will breakdown easily and cause blood sugar and insulin level spikes after meals. This is followed by rapidly plummeting blood sugar levels that have the potential to being fatal, especially to diabetics. The sugar from brown rice is gradually absorbed via blood circulation, which prevents sugar crashes, sugar cravings, and mood swings. Manufacturers add unnatural fortifications in the form of synthetic vitamins and minerals to white rice, creating ‘enriched’ white rice. This allows their products to be marketed to the public as nutritious, despite having its iron, zinc, magnesium, vitamins, and other nutrients stripped during the preparation process. Researchers at the Harvard School of Public Health have suggested that replacing white rice with brown rice may reduce the risk of type 2 diabetes. Eating two or more servings of brown rice weekly is linked with a lower risk of developing type 2 diabetes. However, eating five or more servings of white rice is associated with an increased risk of the same. Qi Sun, an instructor of medicine at Brigham and Women’s Hospital in Boston, and colleagues at Harvard estimate that switching 50 grams daily of uncooked white rice with brown rice would decrease the risk of type 2 diabetes by about 16%. Also, replacing white rice with other whole grains, like barley and wheat, is linked to a 36% reduced risk. Also, rice bran oil (oil extracted from the hard outer brown layer of rice) has been associated with a reduction in “bad” cholesterol. Bad cholesterol receives its name because it transports fat molecules into the artery walls, which is one of the causes of atherosclerosis. The magnesium content in brown rice is four times higher than white rice. Magnesium is essential for body function. Low levels of magnesium in the body have been associated with the development of a number of human illnesses, such as asthma, diabetes, and osteoporosis. Thus, considering the above, it is good to incorporate parboiled brown rice into one’s diet. Brown rice has more vitamins and minerals than white rice, along with a lower glycemic index. In addition, it does not cause a big spike in blood sugar levels, like white rice does. As an added benefit, the parboiled variety of brown rice has less of the crunchy texture that many people do not enjoy. Grubbs, R. D., & Maguire, M. E. (1986). Magnesium as a regulatory cation: criteria and evaluation. Magnesium, 6(3), 113-127. Most, M. M., Tulley, R., Morales, S., & Lefevre, M. (2005). Rice bran oil, not fiber, lowers cholesterol in humans. The American journal of clinical nutrition,81(1), 64-68. Nanri, A., Mizoue, T., Noda, M., Takahashi, Y., Kato, M., Inoue, M., & Tsugane, S. (2010). Rice intake and type 2 diabetes in Japanese men and women: the Japan Public Health Center–based Prospective Study. The American journal of clinical nutrition, ajcn-29512. Ryzen, E., Elbaum, N., Singer, F. R., & Rude, R. K. (1984). Parenteral magnesium tolerance testing in the evaluation of magnesium deficiency. Magnesium, 4(2-3), 137-147. Sun, Q., Spiegelman, D., van Dam, R. M., Holmes, M. D., Malik, V. S., Willett, W. C., & Hu, F. B. (2010). White rice, brown rice, and risk of type 2 diabetes in US men and women. Archives of internal medicine, 170(11), 961-969. Tian, S., Nakamura, K., & Kayahara, H. (2004). Analysis of phenolic compounds in white rice, brown rice, and germinated brown rice. Journal of Agricultural and Food Chemistry, 52(15), 4808-4813. Hagiwara, H., Seki, T., & Ariga, T. (2004). The effect of pre-germinated brown rice intake on blood glucose and PAI-1 levels in streptozotocin-induced diabetic rats. Bioscience, biotechnology, and biochemistry, 68(2), 444-447. Komatsuzaki, N., Tsukahara, K., Toyoshima, H., Suzuki, T., Shimizu, N., & Kimura, T. (2007). Effect of soaking and gaseous treatment on GABA content in germinated brown rice. Journal of Food Engineering, 78(2), 556-560. Zhang, G., Pan, A., Zong, G., Yu, Z., Wu, H., Chen, X., ... & Li, H. (2011). Substituting white rice with brown rice for 16 weeks does not substantially affect metabolic risk factors in middle-aged Chinese men and women with diabetes or a high risk for diabetes. The Journal of nutrition, 141(9), 1685-1690. Imam, M. U., Musa, S. N. A., Azmi, N. H., & Ismail, M. (2012). Effects of white rice, brown rice and germinated brown rice on antioxidant status of type 2 diabetic rats. International journal of molecular sciences, 13(10), 12952-12969.